The key report this week is the April employment report on Friday. Other key indicators include April vehicle sales, the April ISM manufacturing and non-manufacturing indexes, and the March trade deficit. 10:00 AM: ISM Manufacturing Index for April. The consensus is for the ISM to be at 51.5, down from 51.8 in March. The ISM manufacturing index indicated expansion at 51.8% in March. The employment index was at 48.1%, and the new orders index was at 58.3%. 10:00 AM: Construction Spending for March. The consensus is for a 0.5% increase in construction spending. 2:00 PM ET: the April 2016 Senior Loan Officer Opinion Survey on Bank Lending Practices from the Federal Reserve. All day: Light vehicle sales for April. The consensus is for light vehicle sales to increase to 17.3 million SAAR in April from 16.6 million in March (Seasonally Adjusted Annual Rate). This graph shows light vehicle sales since the BEA started keeping data in 1967. The dashed line is the March sales rate. 8:15 AM: The ADP Employment Report for April. This report is for private payrolls only (no government). The consensus is for 193,000 payroll jobs added in April, down from 200,000 added in March. 8:30 AM: Trade Balance report for March from the Census Bureau. This graph shows the U.S. trade deficit, with and without petroleum, through February. The blue line is the total deficit, and the black line is the petroleum deficit, and the red line is the trade deficit ex-petroleum products. The consensus is for the U.S. trade deficit to be at $41.4 billion in March from $47.1 billion in February. 10:00 AM: the ISM non-Manufacturing Index for April. The consensus is for index to increase to 54.7 from 54.5 in March. 10:00 AM: Manufacturers' Shipments, Inventories and Orders (Factory Orders) for March. The consensus is a 0.6% increase in orders. 8:30 AM: The initial weekly unemployment claims report will be released. The consensus is for 262 thousand initial claims, up from 257 thousand the previous week. 8:30 AM: Employment Report for April. The consensus is for an increase of 200,000 non-farm payroll jobs added in April, down from the 215,000 non-farm payroll jobs added in March. The consensus is for the unemployment rate to decline to 4.9%. In March, the year-over-year change was 2.80 million jobs. A key will be the change in real wages. 3:00 PM: Consumer credit from the Federal Reserve. The consensus is for a $15.8 billion increase in credit. Here is the unofficial problem bank list for April 2016. Update on the Unofficial Problem Bank List for April 2016. During the month, the list fell from 222 institutions to 214 after nine removals and one addition. Assets dropped by $2.2 billion to an aggregate $62.4 billion. A year ago, the list held 342 institutions with assets of $105.1 billion. Actions have been terminated against U.S. Century Bank, Doral, FL ($910 million); Community Bank of Florida, Inc., Homestead, FL ($485 million); Florida Capital Bank, National Association, Jacksonville, FL ($341 million); Advantage Bank, Loveland, CO ($265 million); Transcapital Bank, Sunrise, FL ($169 million); Mountain Valley Bank, Dunlap, TN ($96 million); Bank of Newington, Newington, GA ($87 million); and Rocky Mountain Bank & Trust, Florence, CO ($65 million). Trust Company Bank, Memphis, TN ($21 million) exited the list via failure becoming the second bank to fail in 2016. Added this month was First Community National Bank, Cuba, MO ($207 million). Also, the FDIC issued a Prompt Corrective Action order against Proficio Bank, Cottonwood Heights, UT ($110 million), which has been on the list since March 2014. Fannie Mae reported today that the Single-Family Serious Delinquency rate declined in March to 1.44%, down from 1.52% in February. The serious delinquency rate is down from 1.78% in March 2015. This is the lowest rate since June 2008. Note: Freddie Mac has not reported for March yet. The Fannie Mae serious delinquency rate has only fallen 0.34 percentage points over the last year - the pace of improvement has slowed - and at that pace the serious delinquency rate will not be below 1% until 2017. The "normal" serious delinquency rate is under 1%, so maybe Fannie Mae serious delinquencies will be close to normal some time in late 2017. This elevated delinquency rate is mostly related to older loans - the lenders are still working through the backlog. Economist Tom Lawler sent me an updated table below of short sales, foreclosures and all cash sales for selected cities in March. On distressed: Total "distressed" share is down in all of these markets. Springfield IL** 11.2% 12.1% 18.1% N.A. The Chicago Business Barometer decreased 3.2 points to 50.4 in April from 53.6 in March led by a fall in New Orders and a sharp drop in Order Backlogs. It marks a slow start to the second quarter, with most measures down from levels seen a year earlier. The decline in the Barometer was led by a fall in New Orders, leaving it at the lowest level since December 2015. This was below the consensus forecast of 53.4. "Consumer sentiment continued its slow decline in late April due to weakening expectations for future growth, although their views of current economic conditions remained positive. All of the April decline was in the Expectations component, which fell by 4.8% from one month ago and by 12.6% from a year ago and by 14.7% from its January 2015 peak. The retreat from the 2015 peaks was evident across a wide range of expectations about prospects for the national economy. The size of the decline, while troublesome, is still far short of indicating an impending recession. The decline is all the more remarkable given that consumers' assessments of current economic conditions, including their personal finance, have remained largely unchanged at very positive levels during the past year." Personal income increased $57.4 billion, or 0.4 percent, ... according to the Bureau of Economic Analysis. Personal consumption expenditures (PCE) increased $12.8 billion, or 0.1 percent. Real PCE -- PCE adjusted to remove price changes -- increased less than 0.1 percent in March, compared with an increase of 0.3 percent in February. ... The price index for PCE increased 0.1 percent in March, in contrast to a decrease of 0.1 percent in February. The PCE price index, excluding food and energy, increased 0.1 percent, compared with an increase of 0.2 percent. The March PCE price index increased 0.8 percent from March a year ago. The March PCE price index, excluding food and energy, increased 1.6 percent from March a year ago. On inflation: The PCE price index increased 0.8 percent year-over-year due to the sharp decline in oil prices. The core PCE price index (excluding food and energy) increased 1.6 percent year-over-year in March (slightly lower than in February). • At 8:30 AM ET, Personal Income and Outlays for March. The consensus is for a 0.3% increase in personal income, and for a 0.2% increase in personal spending. And for the Core PCE price index to increase 0.1%. • At 9:45 AM, Chicago Purchasing Managers Index for April. The consensus is for a reading of 53.4, down from 53.6 in March. • At 10:00 AM, University of Michigan's Consumer sentiment index (final for April). The consensus is for a reading of 90.4, up from the preliminary reading 89.7. Earlier today, the Census Bureau released the Residential Vacancies and Homeownership report for Q1 2016. The Red dots are the decennial Census homeownership rates for April 1st 1990, 2000 and 2010. The HVS homeownership rate decreased to 63.5% in Q1, from 63.8% in Q4. The rental vacancy rate was unchanged at 7.0% in Q1. I think the Reis quarterly survey (large apartment owners only in selected cities) is a much better measure of the rental vacancy rate, but this does suggest the rental vacancy rate might have bottomed. Overall this suggests that vacancies and the homeownership rate are probably close to the bottom. Residential investment (RI) increased at a 14.8% annual rate in Q1. Equipment investment decreased at a 8.6% annual rate, and investment in non-residential structures decreased at a 10.7% annual rate. On a 3 quarter trailing average basis, RI (red) is positive, equipment (green) is close to zero, and nonresidential structures (blue) is negative. Nonresidential investment in structures typically lags the recovery, however investment in energy and power provided a boost early in this recovery - and is now causing a decline. Other areas of nonresidential are now increasing significantly. I'll post more on the components of non-residential investment once the supplemental data is released. I expect investment to be solid going forward (except for energy and power), and for the economy to continue to grow at a steady pace. Residential Investment as a percent of GDP has been increasing, but is only just above the bottom of the previous recessions - and I expect RI to continue to increase for the next few years. The third graph shows non-residential investment in structures, equipment and "intellectual property products". Investment in equipment - as a percent of GDP - has been moving sideways. Other investment is generally trending up as a percent of GDP, except for nonresidential structures due to less investment in energy and power. The Federal Reserve Bank of Kansas City released the April Manufacturing Survey today. According to Chad Wilkerson, vice president and economist at the Federal Reserve Bank of Kansas City, the survey revealed that Tenth District manufacturing activity declined modestly. “Factories reported a modest decline in activity in April, but expectations for future activity increased to their highest reading of the year”, said Wilkerson. Tenth District manufacturing activity continued to decline modestly, while producers’ expectations for future activity improved considerably. Most price indexes moved slightly higher in April, but remained at low levels. The Kansas City region was hit hard by lower oil prices and the stronger dollar, but the impact is fading. It seems likely the ISM manufacturing index will show slow expansion again in April. In the week ending April 23, the advance figure for seasonally adjusted initial claims was 257,000, an increase of 9,000 from the previous week's revised level. The previous week's level was revised up by 1,000 from 247,000 to 248,000. The 4-week moving average was 256,000, a decrease of 4,750 from the previous week's revised average. This is the lowest level for this average since December 8, 1973 when it was 252,250. The previous week's average was revised up by 250 from 260,500 to 260,750. There were no special factors impacting this week's initial claims. This marks 60 consecutive weeks of initial claims below 300,000, the longest streak since 1973. The previous week was revised up by 1,000. The dashed line on the graph is the current 4-week average. The four-week average of weekly unemployment claims decreased to 256,000. This is the lowest level for the four-week average since 1973. This was below the consensus forecast of 260,000. The low level of the 4-week average suggests few layoffs. Real gross domestic product -- the value of the goods and services produced by the nation’s economy less the value of the goods and services used up in production, adjusted for price changes -- increased at an annual rate of 0.5 percent in the first quarter of 2016, according to the "advance" estimate released by the Bureau of Economic Analysis. In the fourth quarter, real GDP increased 1.4 percent. The increase in real GDP in the first quarter reflected positive contributions from personal consumption expenditures (PCE), residential fixed investment, and state and local government spending that were partly offset by negative contributions from nonresidential fixed investment, private inventory investment, exports, and federal government spending. Imports, which are a subtraction in the calculation of GDP, increased. The deceleration in real GDP in the first quarter reflected a larger decrease in nonresidential fixed investment, a deceleration in PCE, a downturn in federal government spending, an upturn in imports, and larger decreases in private inventory investment and in exports that were partly offset by an upturn in state and local government spending and an acceleration in residential fixed investment. The advance Q1 GDP report, with 0.5% annualized growth, was below expectations of a 0.7% increase. Personal consumption expenditures (PCE) increased at a 1.9% annualized rate in Q1, down from 2.4% in Q4. Residential investment (RI) increased at a 14.8% pace. However equipment investment decreased at a 8.6% annualized rate, and investment in non-residential structures decreased at a 10.7% pace (due to the decline in oil prices). The key negatives were investment in inventories (subtracted 0.33 percentage point), trade (subtracted 0.34 percentage point), nonresidential investment (subtracted 0.76 percentage points) and Federal government spending (subtracted 0.11 percentage points). The final GDPNow model forecast for real GDP growth (seasonally adjusted annual rate) in the first quarter of 2016 is 0.6 percent on April 27, up from 0.4 percent on April 26. GDP growth prospects remain moderate for the first half of the year: the nowcasts stand at 0.8% for 2016:Q1 and 1.2% for 2016:Q2. • At 8:30 AM ET, the initial weekly unemployment claims report will be released. The consensus is for 260 thousand initial claims, up from 247 thousand the previous week. • Also at 8:30 AM, Gross Domestic Product, 1st quarter 2016 (Advance estimate). The consensus is that real GDP increased 0.7% annualized in Q1. • At 11:00 AM, Kansas City Fed Survey of Manufacturing Activity for April. This is the last of the regional Fed manufacturing surveys for April. Inflation has continued to run below the Committee's 2 percent longer-run objective, partly reflecting earlier declines in energy prices and falling prices of non-energy imports. Note: I was expecting a change in the statement characterizing risks as "nearly balanced", but that wasn't included (I think that would have suggested a rate hike in June was more likely). To hike in June, it seems the FOMC will be looking for decent employment reports for April and May, and for inflation to pickup (especially core PCE). This graph shows the year-over-year change for four key measures of inflation: Core PCE, core CPI, trimmed-mean CPI and median CPI (the last two from the Cleveland Fed). On a year-over-year basis in March, the median CPI rose 2.4%, the trimmed-mean CPI rose 2.0%, and the CPI less food and energy rose 2.2%. Core PCE (green) is for February and increased 1.7% year-over-year. Using these measures, inflation has been moving up, and most measures are close to the Fed's target - only core PCE is still below. Core PCE for March will be released this Friday, and core PCE for April will be released on May 31st. If core PCE moves up further, a rate hike in June would be more likely. Not much change. Less mention of "global" risks. Consistent with its statutory mandate, the Committee seeks to foster maximum employment and price stability. The Committee currently expects that, with gradual adjustments in the stance of monetary policy, economic activity will expand at a moderate pace and labor market indicators will continue to strengthen. Inflation is expected to remain low in the near term, in part because of earlier declines in energy prices, but to rise to 2 percent over the medium term as the transitory effects of declines in energy and import prices dissipate and the labor market strengthens further. The Committee continues to closely monitor inflation indicators and global economic and financial developments. The Case-Shiller house price indexes for February were released yesterday. Zillow forecasts Case-Shiller a month early, and I like to check the Zillow forecasts since they have been pretty close. All three headline S&P/Case-Shiller Home Price Indices grew at a slightly slower pace in February compared to January, and the slowdown should extend into March, according to Zillow’s March Case-Shiller forecast. The March Case-Shiller National Index is expected to gain another 0.3 percent in March from February, down from 0.4 percent growth in February from January. We expect the 10-City Index to grow 4.3 percent year-over-year in March, and the 20-City Index to grow 5 percent over the same period, down from annual growth of 4.6 percent and 5.4 percent in February, respectively. The National Index looks set to rise 5.3 percent year-over-year in March, equal to February’s annual growth. 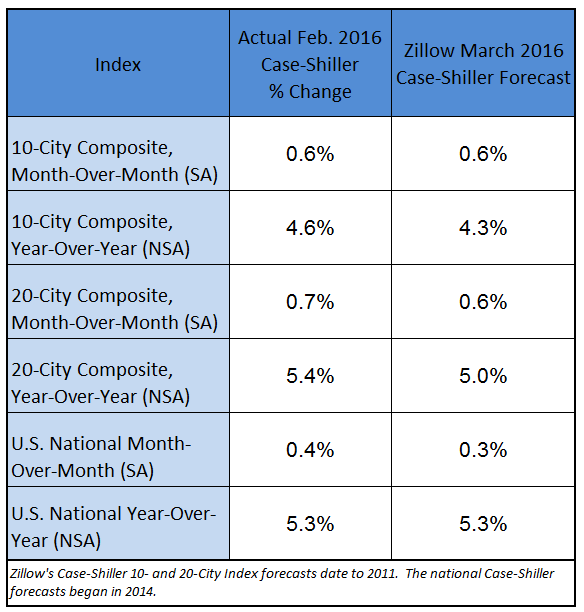 Zillow’s March Case-Shiller forecast is shown in the table below. These forecasts are based on today’s February Case-Shiller data release and the March 2016 Zillow Home Value Index (ZHVI). The March Case-Shiller Composite Home Price Indices will not be officially released until Tuesday, May 31. The year-over-year change for the 10-city and 20-city indexes will probably be lower in the March report than in the February report. The change for the National Index will probably be about the same. The Pending Home Sales Index, a forward-looking indicator based on contract signings, climbed 1.4 percent to 110.5 in March from an downwardly revised 109.0 in February and is now 1.4 percent above March 2015 (109.0). After last month’s slight gain, the index has increased year-over-year for 19 consecutive months and is at its highest reading since May 2015 (111.0). The PHSI in the Northeast increased 3.2 percent to 97.0 in March, and is now 18.4 percent above a year ago. In the Midwest the index inched up 0.2 percent to 112.8 in March, and is now 4.0 percent above March 2015. Pending home sales in the South rose 3.0 percent to an index of 125.4 in March but are still 0.6 percent lower than last March. The index in the West declined 1.8 percent in March to 95.3, and is now 7.9 percent below a year ago. This was above expectations of a 0.5% increase for this index. Note: Contract signings usually lead sales by about 45 to 60 days, so this would usually be for closed sales in April and May. MBA: "Mortgage Applications Decrease in Latest MBA Weekly Survey"
Mortgage applications decreased 4.1 percent from one week earlier, according to data from the Mortgage Bankers Association’s (MBA) Weekly Mortgage Applications Survey for the week ending April 22, 2016. The Refinance Index decreased 5 percent from the previous week. The seasonally adjusted Purchase Index decreased 2 percent from one week earlier. The unadjusted Purchase Index decreased 1 percent compared with the previous week and was 14 percent higher than the same week one year ago. Refinance activity was higher in 2015 than in 2014, but it was still the third lowest year since 2000. Refinance activity has increased a little with lower rates. According to the MBA, the unadjusted purchase index is 14% higher than a year ago. From Goldman Sachs: Goldman: Expect FOMC statement next week to say risks are "nearly balanced"
From me: FOMC Preview: No Rate Hike, Risks "Nearly Balanced"
• At 10:00 AM, Pending Home Sales Index for March. The consensus is for a 0.5% increase in the index. • At 2:00 PM, the FOMC Meeting Announcement. The FOMC is expected to make no change to policy at this meeting. The April meeting of the Federal Open Market Committee (FOMC) will be about the June meeting. Policymakers' fundamental challenge is that the FOMC doesn't want to rule out a June hike, but the markets already have. Here is an indicator that I'm following that appears to be a leading indicator for industrial production. The Chemical Activity Barometer (CAB), a leading economic indicator created by the American Chemistry Council (ACC), expanded 0.6 percent in April following a revised 0.1 percent increase in March and 0.2 percent decline in February. All data is measured on a three-month moving average (3MMA). Accounting for adjustments, the CAB remains up 1.8 percent over this time last year, a marked deceleration of activity from one year ago when the barometer logged a 2.7 percent year-over-year gain from 2014. On an unadjusted basis the CAB jumped 1.4 percent, following a solid 0.8 percent gain in March. Applying the CAB back to 1919, it has been shown to provide a lead of two to 14 months, with an average lead of eight months at cycle peaks as determined by the National Bureau of Economic Research. The median lead was also eight months. At business cycle troughs, the CAB leads by one to seven months, with an average lead of four months. The median lead was three months. The CAB is rebased to the average lead (in months) of an average 100 in the base year (the year 2012 was used) of a reference time series. The latter is the Federal Reserve’s Industrial Production Index. Currently CAB is up slightly year-over-year, and this suggests an increase in Industrial Production over the next year is possible. "Fourteen of 20 cities reported increases in February before seasonal adjustment; after seasonal adjustment, only 10 cities increased for the month." The NSA count is correct (14 of 20 cities increased before seasonal adjustment), but the SA number is incorrect. After seasonal adjustment, all 20 cities increased in February (not 10). The year-over-year increase in prices is mostly moving sideways now around 5%. In February, the index was up 5.3% YoY. In the earlier post, I graphed nominal house prices, but it is also important to look at prices in real terms (inflation adjusted). Case-Shiller, CoreLogic and others report nominal house prices. As an example, if a house price was $200,000 in January 2000, the price would be close to $273,000 today adjusted for inflation (36%). That is why the second graph below is important - this shows "real" prices (adjusted for inflation). It has been almost ten years since the bubble peak. In the Case-Shiller release this morning, the National Index was reported as being 3.0% below the bubble peak. However, in real terms, the National index is still about 17% below the bubble peak. The first graph shows the monthly Case-Shiller National Index SA, the monthly Case-Shiller Composite 20 SA, and the CoreLogic House Price Indexes (through February) in nominal terms as reported. In nominal terms, the Case-Shiller National index (SA) is back to November 2005 levels, and the Case-Shiller Composite 20 Index (SA) is back to April 2005 levels, and the CoreLogic index (NSA) is back to July 2005. In real terms, the National index is back to February 2004 levels, the Composite 20 index is back to November 2003, and the CoreLogic index back to February 2004. On a price-to-rent basis, the Case-Shiller National index is back to August 2003 levels, the Composite 20 index is back to May 2003 levels, and the CoreLogic index is back to August 2003. In real terms, and as a price-to-rent ratio, prices are back to late 2003 and early 2004 levels - and the price-to-rent ratio maybe moving a little more sideways now. S&P/Case-Shiller released the monthly Home Price Indices for February ("February" is a 3 month average of December, January and February prices). The S&P/Case-Shiller U.S. National Home Price Index, covering all nine U.S. census divisions, recorded a 5.3% annual gain in February, unchanged from the previous month. The 10-City Composite increased 4.6% in the year to February, compared to 5.0% previously. The 20-City Composite’s year-over-year gain was 5.4%, down from 5.7% the prior month. Before seasonal adjustment, the National Index posted a gain of 0.2% month-over-month in February. The 10-City Composite recorded a 0.1% month-over-month increase while the 20-City Composite posted a 0.2% increase in February. After seasonal adjustment, the National Index recorded a 0.4% month-over-month increase. The 10-City Composite posted a 0.6% increase and the 20-City Composite reported a 0.7% month-over-month increase after seasonal adjustment. Fourteen of 20 cities reported increases in February before seasonal adjustment; after seasonal adjustment, only 10 cities increased for the month. The Composite 10 index is off 11.4% from the peak, and up 0.6% in February (SA). The Composite 20 index is off 9.7% from the peak, and up 0.7% (SA) in February. The National index is off 3.0% from the peak, and up 0.4% (SA) in February. The National index is up 31.0% from the post-bubble low set in December 2011 (SA). The Composite 10 SA is up 4.6% compared to February 2015. The Composite 20 SA is up 5.3% year-over-year.. The National index SA is up 5.3% year-over-year. Texas factory activity increased for a second month in a row in April, according to business executives responding to the Texas Manufacturing Outlook Survey. The production index, a key measure of state manufacturing conditions, rose from 3.3 to 5.8, suggesting a slight pickup in output growth. Labor market indicators reflected persistent weakness in April. The employment and hours worked indexes remained negative for the fourth straight month but rose to -3.7 and -1.0, respectively. Fourteen percent of firms noted net hiring, and 18 percent noted net layoffs in April. This is the second consecutive month of manufacturing growth in Texas. • At 8:30 AM ET, Durable Goods Orders for March from the Census Bureau. The consensus is for a 1.6% increase in durable goods orders. • At 9:00 AM, S&P/Case-Shiller House Price Index for February. Although this is the February report, it is really a 3 month average of December, January and February prices. The consensus is for a 5.5% year-over-year increase in the Comp 20 index for February. 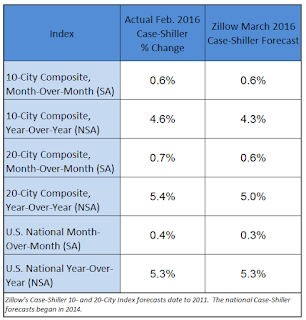 The Zillow forecast is for the National Index to increase 5.3% year-over-year in February. • At 10:00 AM, the Richmond Fed Survey of Manufacturing Activity for April. Vehicle Sales Forecast: "April Sales to Return to 17 Million SAAR Trend"
The automakers will report April vehicle sales on Tuesday, May 3rd. Note: There were 27 selling days in April, up from 26 in April 2015. WardsAuto forecast calls for U.S. automakers to deliver 1.52 million light vehicles in April, a record-high volume for the month. The report puts the seasonally adjusted annual rate of sales for the month at 17.6 million units, well above last month’s 16.5 million and year-ago’s 16.7 million. The monthly volume will be 5.0% above last year. Beyond an extra selling day, this April lacks the Easter holiday, allowing full sales over five weekends. Total light-vehicle sales in April are expected to reach 1,523,000, up 1% on a selling-day adjusted basis from 1,452,241 from a year ago and the strongest total sales in April on record. The SAAR for total sales is projected at 17.6 million units in April 2016, up 0.8 million units from 16.7 million a year ago. The new home sales report for March was eleven thousand below expectations at 511,000 on a seasonally adjusted annual rate basis (SAAR), however combined sales for December, January and February were revised up by 23 thousand SAAR - so overall this was a decent report. Sales were up 5.4% year-over-year (YoY) compared to March 2015. And sales are up 1.3% year-to-date compared to the same period in 2015. Earlier: New Home Sales decreased to 511,000 Annual Rate in March. This graph shows new home sales for 2015 and 2016 by month (Seasonally Adjusted Annual Rate). So far 2016 is barely ahead of 2015, although the comparisons for the first two months were difficult. The comparisons through the summer will be easier. Overall I expect lower growth this year, probably in the 4% to 8% range. Slower growth is likely this year because Houston (and other oil producing areas) will have a problem this year. Inventory of existing homes is increasing quickly and prices will probably decline in those areas. And that means new home construction will slow in those areas too. The "distressing gap" graph shows existing home sales (left axis) and new home sales (right axis) through March 2016. This graph starts in 1994, but the relationship had been fairly steady back to the '60s. The Census Bureau reports New Home Sales in March were at a seasonally adjusted annual rate (SAAR) of 511 thousand. The previous three months were revised up by a total of 23 thousand (SAAR). "Sales of new single-family houses in March 2016 were at a seasonally adjusted annual rate of 511,000, according to estimates released jointly today by the U.S. Census Bureau and the Department of Housing and Urban Development. This is 1.5 percent below the revised February rate of 519,000, but is 5.4 percent above the March 2015 estimate of 485,000." The months of supply was increased in March to 5.8 months. "The seasonally adjusted estimate of new houses for sale at the end of March was 246,000. This represents a supply of 5.8 months at the current sales rate." In March 2016 (red column), 48 thousand new homes were sold (NSA). Last year 46 thousand homes were sold in March. The all time high for March was 127 thousand in 2005, and the all time low for March was 28 thousand in 2011. This was below expectations of 522,000 sales SAAR in March, however prior months were revised up. A decent report. I'll have more later today. The year-over-year increase in the index has been about the same for the last year. Home prices in the Dallas metro area, historically one of the nation’s most stable and affordable markets, have climbed at one of the fastest rates in the U.S. since 2014. Inventories of houses on the market are under two months’ supply, the lowest in 25 years. “The demand is staggering,” said Ms. Durnal, an agent with real-estate brokerage firm Redfin. The escalating prices and tightening availability of homes in Dallas point to the challenges facing many of the nation’s largest real-estate markets as the crucial spring selling season heats up. With prices "escalating", where is the supply? There are probably several reasons supply hasn't picked up. As housing economist Tom Lawler noted several years, there has been a significant number of single family houses that have been converted to rentals. These properties are mostly still being rented, reducing the potential pool. Another reason for low supply is that new home sales are still historically low - partly because builders have focused on higher priced homes (this is changing a little with more entry level homes coming on the market). And low supply can be self-fulfilling for a period of time since people only want to list their home for sale if they know they can find one to buy. There could be a demographic reason too: Baby boomers are mostly aging in place and waiting until they are older (maybe closer to 80) to downsize. Eventually this will change, and more inventory will come on the market. • 10:00 AM ET, New Home Sales for March from the Census Bureau. The consensus is for an increase in sales to 522 thousand Seasonally Adjusted Annual Rate (SAAR) in March from 512 thousand in February. • 10:30 AM, Dallas Fed Manufacturing Survey for April. From CNBC: Pre-Market Data and Bloomberg futures: currently S&P futures are up 3 and DOW futures are up 15 (fair value). Oil prices were up over the last week with WTI futures at $43.49 per barrel and Brent at $45.11 per barrel. A year ago, WTI was at $56, and Brent was at $62 - so prices are down about 25% year-over-year. Here is a graph from Gasbuddy.com for nationwide gasoline prices. Nationally prices are at $2.14 per gallon (down about $0.35 per gallon from a year ago). FOMC Preview: No Rate Hike, Risks "Nearly Balanced"
The FOMC dropped the phrase about "balanced" risks from the statements in January and March, and the FOMC is expected to add the phrase back in the statement this week - to prepare the markets for a possible rate hike in June or July. "The Committee continues to see the risks to the outlook for economic activity and the labor market as nearly balanced ..."
"Information received since the Federal Open Market Committee met in January suggests that economic activity has been expanding at a moderate pace despite the global economic and financial developments of recent months." "However, global economic and financial developments continue to pose risks." There might be less concern in the statement about global risks in the April statement. Also the FOMC might mention that growth has slowed in Q1 (Q1 GDP growth will be released on Thursday and is expected to show 0.7% annualized growth rate), and the statement might mention the pickup in the labor force participation rate. The key - for a possible June rate hike - will be if the FOMC sees the risks as "balanced". The key economic reports this week are the first estimate of Q1 GDP, March New Home sales, and the Case-Shiller House Price Index for February. The FOMC is meeting on Tuesday and Wednesday, and no change in policy is expected at this meeting. The consensus is for a increase in sales to 522 thousand Seasonally Adjusted Annual Rate (SAAR) in March from 512 thousand in February. 10:30 AM: Dallas Fed Manufacturing Survey for April. 8:30 AM: Durable Goods Orders for March from the Census Bureau. The consensus is for a 1.6% increase in durable goods orders. 9:00 AM: S&P/Case-Shiller House Price Index for February. Although this is the February report, it is really a 3 month average of December, January and February prices. This graph shows the nominal seasonally adjusted National Index, Composite 10 and Composite 20 indexes through the January 2016 report (the Composite 20 was started in January 2000). The consensus is for a 5.5% year-over-year increase in the Comp 20 index for February. The Zillow forecast is for the National Index to increase 5.3% year-over-year in February. 10:00 AM: Richmond Fed Survey of Manufacturing Activity for April. 10:00 AM: Pending Home Sales Index for March. The consensus is for a 0.5% increase in the index. 2:00 PM: FOMC Meeting Announcement. The FOMC is expected to make no change to policy at this meeting. 8:30 AM: The initial weekly unemployment claims report will be released. The consensus is for 260 thousand initial claims, up from 247 thousand the previous week. 8:30 AM ET: Gross Domestic Product, 1st quarter 2016 (Advance estimate). The consensus is that real GDP increased 0.7% annualized in Q1. 11:00 AM: Kansas City Fed Survey of Manufacturing Activity for April. This is the last of the regional Fed manufacturing surveys for April. 8:30 AM ET: Personal Income and Outlays for March. The consensus is for a 0.3% increase in personal income, and for a 0.2% increase in personal spending. And for the Core PCE price index to increase 0.1%. 9:45 AM: Chicago Purchasing Managers Index for April. The consensus is for a reading of 53.4, down from 53.6 in March. 10:00 AM: University of Michigan's Consumer sentiment index (final for April). The consensus is for a reading of 90.4, up from the preliminary reading 89.7. El Niño was a bust this winter in California. Although the state received more precipitation than the previous four years - that isn't saying much. Here are a few resources to track the drought. These tables show the snowpack in the North, Central and South Sierra. Currently the snowpack is about 56% of normal for this date. And here are some plots comparing the current and previous years to the average, a very dry year ('76-'77) and a wet year ('82-'83). This winter was close to an average year in the North and Central Sierra, but below average in the southern section. For Pacific Crest Trail and John Muir Trail hikers, I recommend using the Upper Tyndall Creek sensor to track the snow conditions. This is the fifth dry year in a row along the JMT - although more snow than the previous four years. There will probably be adequate water and not too much snow on the passes. This graph shows the snow water content for Upper Tyndall Creek for the last 20 years. There is more snow than the previous four years, but that isn't saying much. Note: I hiked the trail in September 1998 - a very wet year - and there was snow all year on Whitney. Goldman: Expect FOMC statement next week to say risks are "nearly balanced"
The FOMC meets next week and no change in policy is expected. The focus will be on the wording and for any hint of a June rate increase. Financial markets once again expect the FOMC to stand pat at its upcoming meeting. Indeed, minutes from the March FOMC meeting essentially ruled out any action next week ... Nonetheless, the statement accompanying Wednesday’s decision could offer important signals for the near-term policy outlook. The key question will be what the committee does with its balance of risks assessment, which has been excluded from the statements following the last two meetings. We expect the statement to say that risks to the outlook are “nearly balanced”, or to otherwise indicate that downside risks have receded somewhat since early this year. American Trucking Associations’ advanced seasonally adjusted For-Hire Truck Tonnage Index decreased 4.5% in March, following a 7.2% surge during February. In March, the index equaled 137.6 (2000=100), down from 144 in February. February’s level is an all-time high. Compared with March 2015, the SA index was up 2.2%, which was down from February’s 8.6% year-over-year gain. Year-to-date, compared with the same period in 2015, tonnage was up 3.9%. As expected, tonnage came back to earth in March from the jump in February,” said ATA Chief Economist Bob Costello. “These things tend to correct, and March took back more than half of the surprisingly large gain in February. The index is now up 2.2% year-over-year. According to Black Knight's First Look report for March, the percent of loans delinquent decreased 8.4% in March compared to February, and declined 12.4% year-over-year. The percent of loans in the foreclosure process declined 3.7% in March and were down 25.6% over the last year. Black Knight reported the U.S. mortgage delinquency rate (loans 30 or more days past due, but not in foreclosure) was 4.08% in March, down from 4.48% in February. This is the lowest delinquency rate since March 2007. The percent of loans in the foreclosure process declined in March to 1.25%. The number of delinquent properties, but not in foreclosure, is down 287,000 properties year-over-year, and the number of properties in the foreclosure process is down 215,000 properties year-over-year. Black Knight will release the complete mortgage monitor for March in early May. Apartment markets appeared mixed in the April 2016 National Multifamily Housing Council (NMHC) Quarterly Survey of Apartment Market Conditions, with two of four indexes landing below the breakeven level of 50. The Market Tightness (43) and Equity Financing (45) indexes showed declining conditions for the second quarter in a row, while Sales Volume (53) and Debt Financing (50) indicated improving and steady conditions, respectively. Consumer demand for apartments declined in the Market Tightness Index, dropping four points to 43. After seven quarters reporting tighter conditions, this marks the second quarter indicating a looser market. This is the second consecutive month of looser conditions - it appears supply has caught up with demand - and I expect rent growth to slow (the vacancy rate is also starting to increase). Earlier: Chicago Fed: "Index shows economic growth below average in March"
The Chicago Fed National Activity Index (CFNAI) edged down to –0.44 in March from –0.38 in February. Three of the four broad categories of indicators that make up the index decreased from February, and all four categories made nonpositive contributions to the index in March. The index’s three-month moving average, CFNAI-MA3, decreased to –0.18 in March from –0.11 in February. March’s CFNAI-MA3 suggests that growth in national economic activity was somewhat below its historical trend. The economic growth reflected in this level of the CFNAI-MA3 suggests subdued inflationary pressure from economic activity over the coming year. This suggests economic activity was below the historical trend in March (using the three-month average). What is the National Activity Index? The index is a weighted average of 85 indicators of national economic activity drawn from four broad categories of data: 1) production and income; 2) employment, unemployment, and hours; 3) personal consumption and housing; and 4) sales, orders, and inventories. Firms responding to the Manufacturing Business Outlook Survey reported no improvement in business conditions this month. The indicator for general activity, which rose sharply in March, fell to a slightly negative reading in April. Other broad indicators suggested a similar relapse in growth that was reported last month. The indicators for both employment and work hours also fell notably. Despite weakness in current conditions, the survey’s indicators of future activity showed continued improvement, suggesting that the fallback is considered temporary. The survey’s indicators of employment corroborate weakness in the other broad indicators this month. The employment index decreased 17 points and registered its fourth consecutive negative reading. This was below the consensus forecast of a reading of 9.0 for April. Here is a graph comparing the regional Fed surveys and the ISM manufacturing index. The yellow line is an average of the NY Fed (Empire State) and Philly Fed surveys through April. The ISM and total Fed surveys are through March. The average of the Empire State and Philly Fed surveys remained positive in April (yellow). This suggests the ISM survey will probably be above 50 again this month.